Private Speed Boat Charter day trips are by far the best and most enjoyable way to take in the natural beauty of the offshore islands around Phuket. Day trips aboard a private speed boat are perfect for people in search of a relaxing and enjoyable day on the water. 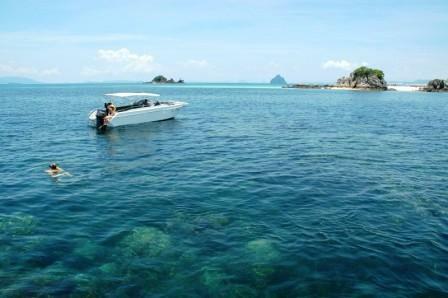 Snorkeling and island hopping from one island to another, aboard your very own private speed boat. Just the Captain and an experienced guide, you and your family or friends. 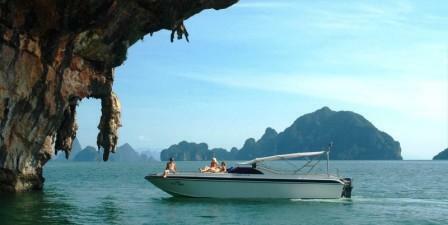 Your probably thinking that there are lots of speed boat tours available in Phuket. And yes there is, however most of these day trips are not that enjoyable, as they are overcrowded and rushed. Theses types of tours usually start with a mini van picking you up from your resort then stopping numerous times along the way to pick up other passengers before you finally arrive at the pier. The speed boats are usually crowded, as are the locations that the tours go to and the boat operators run their day trips to a very tight schedule, not leaving you with enough time to truly enjoy your day. Why not spoil yourself and your loved ones, with a day trip to one of the many islands around Phuket on-board your very own private speed boat. Chartering your own private speed boat offers you the flexibility to choose that perfect spot for snorkeling and swimming or just chilling on a secluded beach, away from the mass crowds. 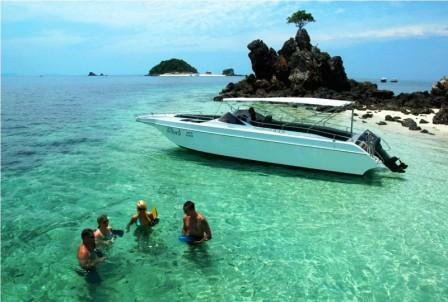 There are some fantastic islands around Phuket you can visit by chartering a speed boat. From a full day of exciting activities or half day adventures, or maybe a romantic sunset voyage just for two. Over the years of traveling to Phuket we have lost count of the many day trips and tours we have done. So much so, that the kids cringe when we mention the word “daytrip”. But I am happy to say that our day trip on-board this private speed boat tour was perfect for all of us, and most importantly it got the tick of approval from the kids. Our private speed boat took us to the beautiful Banana Beach on Coral Island where we spent hours snorkeling and swimming in the crystal clear waters, away from the crowds and other day trippers. After lots of snorkeling we were provided with an ample supply of refreshments and a fruit platter while we enjoyed relaxing on the beach. When we were ready to move on, we got back on board the speed boat. The Captain then suggested that some of the best snorkeling was just offshore, and asked us if we would like to stop there for more snorkeling before we headed on to Bon island. He was right, it was amazing the water was crystal clear and there was a variety of colorful sea life. The crew snorkeled alongside us showing us things we would have missed if they were not there to guide us. When we were all back on board, we then set off to Bon Island where we had time to relax and chill out on the beautiful beach. Our trip on board the private speed boat charter was an amazing experience and a must do for anyone heading to Phuket. Below is a list of some of the wonderful destinations and packages that you can visit by private speed boat from Phuket. For further information on any of these private speedboat charters and other Island hoping tours around Phuket have a chat with our friends Deigo & Ingo at Easy Day Thailand who will assist you in planning a fun day out on the water. 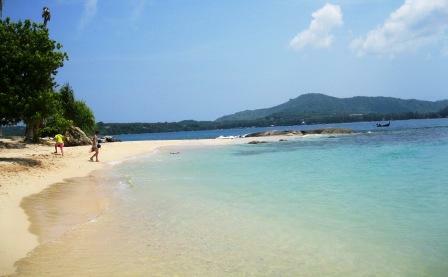 Coral Island is a beautiful island located just south of Phuket. There are two main beaches on the Island, "Long Beach" and "Banana Beach"as well as a few quiet bays on the other side. Banana Beach has a great snorkeling areas with an abundance of colorful, tropical fish. The reefs are shallow and sheltered and it only takes around 15 minutes to reach the island, a great spot if you don’t want to travel too far by boat. Koh Khai Nok is a picturesque island located off the East Coast of Phuket. The Island is quite small, fringed with a pristine white sandy beach and is surrounded by a spectacular, shallow reef which is ideal for snorkeling. Small reef fish often come into the ankle deep water, so even non-swimmers can enjoy the marine life, suitable for all ages especially kids. The reefs are teeming with tropical fish, Barracuda, octopus and dolphins are often spotted at Racha Yai along with the occasional jumping sailfish. Enjoy a relaxing speedboat ride to Coral Island where you can snorkel at twilight over the beautiful coral reefs or sit back and relax on the beach before heading back to Phuket as the sunsets. This unique tour is perfect for those who wish to avoid the hottest part of the day or a great way to begin a romantic evening in paradise. Enjoy a romantic escape with this full day private speed boat charter for two on a secluded beach at either Koh Khai Nok Island or Racha Yai Island. You can spoil your loved one with this special day trip which includes a delicious lunch, wine and a beautiful bouquet of flowers. Phi Phi Islands are famous for their spectacular scenery, beautiful beaches and great snorkeling. This day trip takes you to the stunning Maya Bay, the Viking cave and a visit to all the landmarks that make these islands so famous. 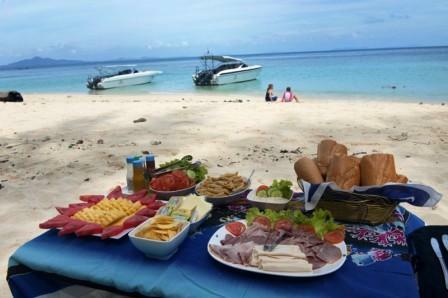 Enjoy a picnic lunch on the beach and snorkeling at Bamboo Island. A day trip to Phang Nga Bay is a breathtaking and a scenic experience, that shouldn’t be missed when visiting Phuket. It is an excellent location for sightseeing as it offers magnificent scenery with famous caves and landmarks such as James Bond Island and Hong Island. Explore the uninhabited offshore islands of Krabi, including Poda Island, Chicken Island and Hong Island as well as the beautiful Railay and Phra Nang Beaches in Krabi. This day trip includes stopping at Koh Khai Nok Islands for some snorkeling on your way back to Phuket. If your up for more adrenaline pumping water activities why not have a go at water skiing, kneel boarding or wake boarding. There are special training boards available for the kids or beginners. Wine and flowers are included in the romantic escape package. The speed boats are very comfortable with large covered areas and are fitted with all safety equipment. For the more adventurous there are also great combination tours available to Ko Phi Phi & Krabi or Phang Nga Bay and Krabi. Customized packages are also available for large groups of 18 or more people. Please complete the following contact form below for more information about any of the above speed boat charters, combination tours, personalized itineraries, quotes and up to date prices. Once we receive the completed form your information will be forwarded to the speed boat charter company who will then forward you all the details you request.